This statement by the Special Rapporteur on Torture encapsulates the particular situation of vulnerability in which LGBTI detainees find themselves when deprived of their liberty. The response from the international community, however, has been fragmented and inconsistent. Today Penal Reform International (PRI) and the Association for the Prevention of Torture (APT) are launching a new thematic paper on how bodies monitoring detention can contribute to the prevention of torture and ill-treatment against sexual minorities in detention. Arrests on the basis of sexual orientation or gender identity and abuse during interrogations occur frequently in some countries, especially where homophobia and transphobia exist in police culture and where discrimination by public officials occurs with impunity. In countries where homosexuality is criminalised, the risk of a confession being extorted is even higher, and the possibility of recourse to law as a means of redress for such abuses is limited. Body searches, a high-risk situation for every detainee, can be even more humiliating for LGBTI persons and put them at even greater risk of both abuse and discrimination. The small number of sexual minorities amongst the prison population contributes to the neglect this group faces, in terms of the protection they receive as well as their specific needs. They face a high risk of abuse, including sexual abuse, from both law enforcement officials and fellow detainees. According to the US Bureau of Justice Statistics, for example, 3.5 per cent of men who identified themselves as heterosexual had been sexually abused by another inmate, compared to 34 per cent of bisexual men, and 39 per cent of gay men. In order to protect them, authorities often make excessive recourse to isolation and even solitary confinement, not only putting individuals’ long-term mental health at risk, but further adding to their stigmatisation, and to discrimination in access to services and activities, including education and rehabilitation programmes. Despite the bleakness of the overall picture, there are examples of good practices from state authorities, such as special provisions relating to search procedures for transgender detainees or specific counselling for LGBTI detainees. Detention monitoring bodies can play a crucial role in strengthening the protection of sexual minorities in detention and contribute to building a future where LGBTI detainees are not ill-treated, humiliated and discriminated against in police custody or prison because of who they are. Our new thematic paper – LBGTI persons deprived of their liberty: A framework for preventive monitoring – seeks to provide guidance on assessing risk factors and making recommendations to improve their condition of treatment. It forms a part of the Detention Monitoring Tool jointly developed by PRI and APT within PRI’s three-year EU funded project, Strengthening institutions and building civil society capacity to combat torture in nine CIS countries, which aimed to strengthen monitoring mechanisms, including National Preventive Mechanisms, and to develop their capacity to counter torture and ill-treatment. The Tool as a whole will be published on 15 November 2013, comprising four Thematic papers and five Factsheets. 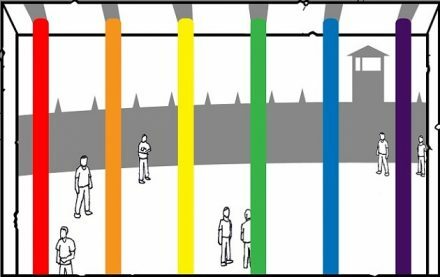 A short paper examining how monitoring bodies can start to address discrimination and abuse in detention on the basis of sexual orientation and gender identity. Part of the PRI/APT Detention Monitoring Tool.